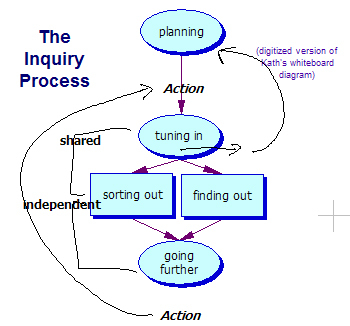 Inquiry tends to meander according to interest and priority, but still adheres to a basic plan. Going to look at the essential questions behind inquiry based learning. What interests Kath is how the theory of inquiry learning stacks up against the practical application in the classroom. Blessing and curse of the job is that teachers never stop learning (good teachers anyway). We started with Personal goal setting for the day. Here’s mine – stay focussed, on topic, resist the temptation to pursue distractions, and reflect back on my classroom practice. Sometimes, reflection involves interaction with others in the pursuit of clarity. Why goal setting? Inquiry as a methodology is much bigger than units of work. Start the year by inquiring into learning - self assessing and goal setting. We did a partner questioning activity using the five whys process (5 whys before you insert a how). Metacognition is regulating your thinking after you’re noticed it. Question was “Why use inquiry thinking?” My first response was that we want students to take responsibility for their own learning. Teachers often have own agenda when using questioning in the classroom. Talked about the concept of “wait time” when responding to deeper questions. Why? Engagement, independent learning skills, understanding, integration, connected teaching and learning, cater for learning styles, transferable process (for all learner, not just those designated as students) and tapping into students’ curiosity. What is the essence of inquiry? Y chart exercise and placemat activity. Visual organiser, used to examine an unusual object. Inquiry is not just students choosing what they want to do with the teacher becoming the “guide on the side” providing resources and inspiration. My thought –inquiry is structured but not restrictive. Use learning strategies, not just classroom activities. Have menus of strategies in the classroom - create your own menus. See “Classroom Connections. Strategies for Integrated Learning” by Kate Murdoch. Students need to be building on what they already know. Inquiry classrooms are explicit environments, talking about the topic that is being explored as well as consciously focussing on specific skills. If it’s inquiry, then questions will be driving it. Students will be working though a sustained investigation, actively gathering and processing information / data for deeper understanding. It’s about building skills and strategies with a strong emphasis on developing understanding not just fact finding, with students have opportunity to pursue questions of their own. An interesting comment from the audience about the role of facts - hunting and gathering of information needs to move onto deeper exploration. Use the “facts of the day” to build understanding of concepts. Question the content as it’s not just about recall. Not all units of work need to be the same length – give time when it is needed. Different forms of inquiry – “project” oriented inquiry (driver by action or culminating task), inquiries that accompany key events in the school, local or global community (used the example of the Olympics which car be done as medal tallies, flags, athlete biographies or the concepts behind the Olympics can be used for deeper learning). Open up topics to a more generative question (what makes a good pet?) and the use of spontaneous inquiry. Finding out: How can we investigate this? Still important to ask the kids how they might learn about their topic? If using an expert, how do we make sure that the students get the most of the opportunity? How to gather information, sorting out and make understanding of it. The sorting out process is very important - take the time to pause, reflect and check on whether students understand. One method to do a "temperature check" using five sentence starters about the topic - 1. I learned... 2. I used... 3. I tried... 4. I felt... 5. I wondered... Another method was the fishbowl activity that has one group sorting ambiguous statements into "more true" or "more false" categories while others observe. In the adult setting of today, my colleagues noticed the phenomenon of the "piranha" in the fishbowl - the person who grabbed all the statements and then sorted through with their method of consultation being, "I think this. Don't you agree?" Kath's point about what work in the inquiry process gets done where - synthesizing at school under the guidance of the teacher, while leaving gathering information and creating presentation are suitable for home based work. She emphasised the importance of the "pause" button along the way - and that one of the best ways for me to cement what has been learned is for me to teach someone else. Finally, how we frame the inquiry up in the first place? Why is this question/topic the focus? What is it that we want our students to understand? What is it that we want them to be? That's the end of the notes - a reflective post on what this all means for my classroom coming in the near future. So much to consider in terms of what I do in relation to our student Personal Research Projects, our global collaboration projects, what I read over at Konrad's blog recently and my comment exchanges with Artichoke. Some of what I do runs parallel to Kath's processes and ideas but others branch off into different areas and some unexplored territory - and I'm not convinced that I'm totally wrong. Posted in Conferences & PD on September 5, 2007 by Graham.